Heat oven to 450°F. Unroll both pie crusts onto work surface. Using rolling pin, roll out pie crusts slightly. Using 2-inch round cutter, cut 24 rounds from pie crusts, rerolling scraps if needed. Press each pastry round into ungreased miniature muffin cup, folding edges if needed. Generously prick each crust with fork. Bake 4 to 6 minutes or until light golden brown. Cool in pan 2 minutes; remove from pan to cooling rack. Cool completely, about 15 minutes. Fill each pie shell with equal amount of dulce de leche. In microwavable bowl, microwave chocolate chips and cream on High for 30 seconds. Stir until smooth. 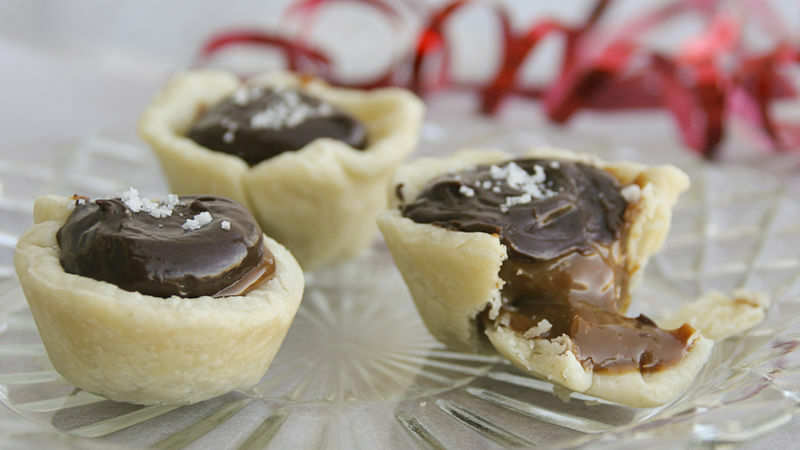 Divide chocolate mixture evenly onto tops of each mini pie. Sprinkle tops with sea salt for garnish. Substitute semisweet chocolate chips for the milk chocolate ones to cut back on the sweetness. These mini pies would go perfectly on any dessert buffet table. Make the day of the party easier by baking the pie shells a day ahead of time and storing them in an airtight container.